Brent M. Giuffre, MD was named Medical Director of the Department of Emergency Medicine at Lane Regional Medical Center in October 2015. Prior to this position he was Medical Director of Emergency Medicine at St. Charles Parish Hospital in Luling, Louisiana and has more than 10 years of experience in Emergency Medicine. 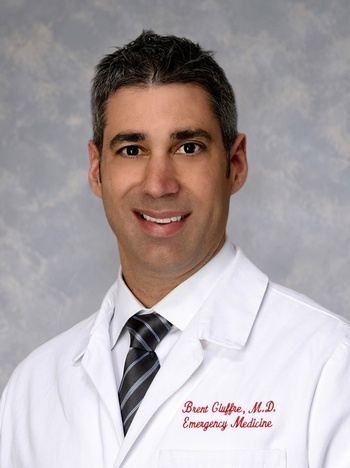 Originally from New Orleans, Dr. Giuffre graduated from the University of New Orleans, earned his medical degree at Louisiana State University School of Medicine in New Orleans, and completed his internship and Emergency Medicine residency training at Earl K. Long Memorial Hospital in Baton Rouge. He is certified by the American Board of Emergency Medicine and is a member of the American College of Emergency Physicians. Dr. Giufre and his wife Kendall live in Zachary with their son Grey.